1. Determine the number of employees that you require on this lockout-tagout system. 2. Determine how many employees will need to receive more than one safety padlock for lock-out. Those employees should get KA (Keyed Alike) padlocks. The key opens only one padlock. Each padlock has its own key. 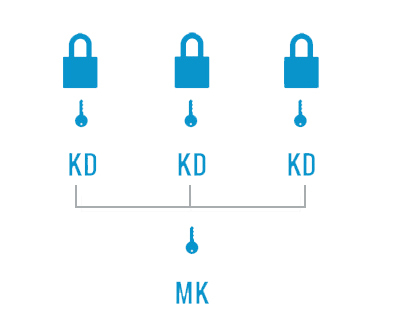 All keys are the same and open all padlocks within in a group. 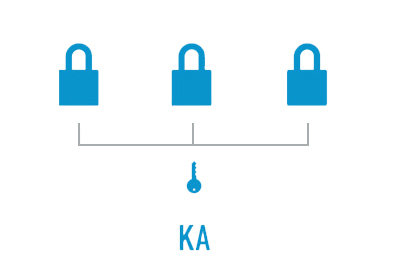 A Master Key can open all padlocks across several groups (KD and or KA). To maintain the integrity of a Safety Lock-Out System, it is vital to ensure no duplicate keys are issued. Lockout-tagout-shop provides a Free Key Charting Service to record the key numbers used by customers. Once a system is registered, Lockout-tagout-shop.com will send you a unique USER I.D. number. By using that I.D. 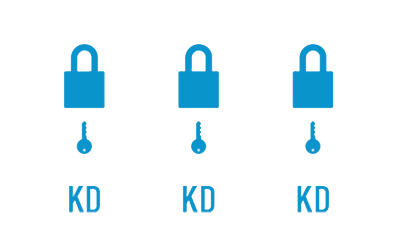 each time you order padlocks, we assign a new key code for each new lock. Thus ensuring no unintended duplication of keys. A permanent and durable method to customize your safety lock-out padlocks. Front, back, both sides of the padlock body and the key. De engraving may include, text, numbers and symbols. For the engraving of logos we need a -.pcx, -.tif or .bmp format files. For orders with unique engravings on every padlock we provide an Excel®-spreadsheet. Please beware to not exceed the maximum length of the engraving. 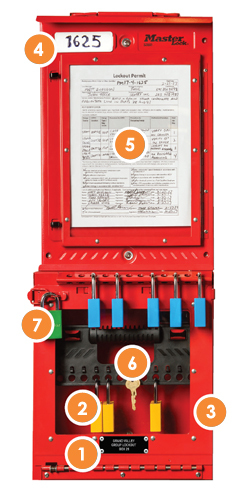 During the energy-isolation process, workers can use documentation, key number and the balance of locks in the box to verify the lockout was performed correctly. During equipment audits, missing locks are easy to identify. Engraving the key number on the locks will simplify the process of ordering replacements. 1 Assign station to an area or machine. We can produce laser-engraved tags marked to your specifications. 2 Use a keyed-alike set of equipment locks in the color specified by your lockout program. Permanently mark the key with the key number. Multiple padlock color options offered. LifeGuard™, a no-charge key-charting system, is available to build your system of locks and prevent unintentional key duplication. 3 Assign equipment locks to station. Ensure appropriate quantity of locks for the location. Engrave lock information and key number on station tag. Engrave locks in set with sequential numbers (e.g. Lock 3 of 10) and key number. Lockout-tagout-shop can engrave locks and tags to your specifications. 4 Designate station for a particular job. Use a job-specific identifier, such as a permit or work order number, to associate the box with the work being done. Station includes rewritable tag that can be marked with job-specific information. Permit display case protects paperwork while maintaining its visibility and accessibility. 6 ZDisplay the key in a way that the key number is readable during lockout. Lock caddy includes hooks to position the key in the center of the lock box window. 7 Initiate the lockout by using an operations or control lock in a specific color. This also provides lockout coordinators a level of control over releasing and re-energizing the locked out equipment. Station includes latch hole to further distinguish operations lock from personal locks.